Puppies. Babies. Mini juices. We’re in love with tiny versions of the things we adore most and we know you get it. Today through Valentine’s Day, Pressed Juicery is offering free mini juice-grams that can be sent to lovers, friends and other miscellaneous humans you think could use a delicious thrill. The best part? 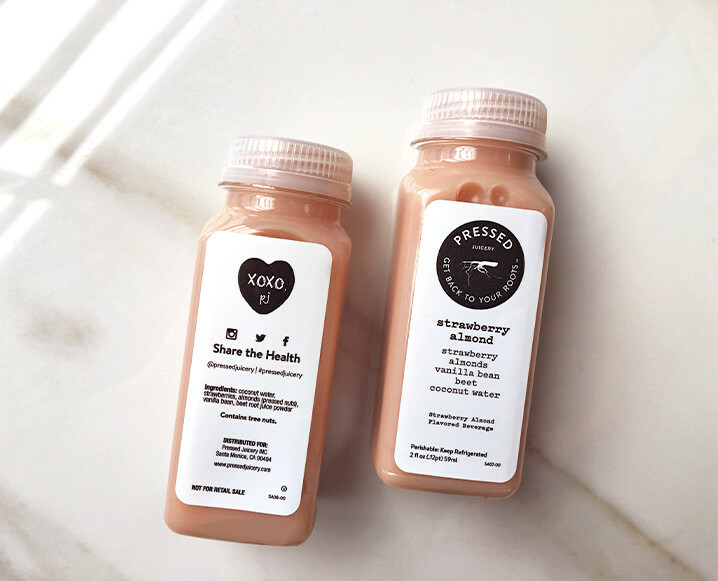 One of the flavors available is Pressed’s new baby pink Strawberry Almond – one of the best nut milk flavors we’ve tasted anywhere in a long time and sweetened with a splash of coconut water. Pick from three options: Red (Roots 3) for Love, Yellow (Citrus 2) for Friendship or Pink (Pressed’s new Strawberry Almond) for Joy. Enter the recipient’s info here to have their juice gram (and yours!) ready to pick up at the closest Pressed location. Juice grams are available from February 2nd to February 14th only! Share the post "You’ve Got Mail: Pressed Juicery’s Mini Juice Grams Are Everything"